Situational awareness: Bellingcat, the U.K.-based investigative group, says it has identified the second Russian operative who poisoned Russian double agent Sergei Skripal. It says he is Alexander Mishkin, who, like the first operative Bellingcat identified, is with Russian military intelligence. Last week, we described the long-term crisis for democracy. But advanced Western economies face another pressure point — artificial intelligence, which is proving to be a new advantage to autocratic government. The bottom line: Tyrants thrive on centralized power. The sudden ability to monitor and assess subjects 24/7 is a boon for top-down power — and a blow to the more chaotic and dispersed bottom. Andrew Ng, who founded Google Brain and the AI shop at Baidu, stopped by Axios last week and told us that Big Data and fast computing power "allow information to flow very quickly to the center." At once, central planning, the crippling bane of the Soviet and pre-1979 Chinese economic systems, can begin to challenge the superiority of the free market — the "invisible hand" — as envisioned in the 18th century by Adam Smith, he said. Smith "was the dominant economics paradigm for centuries. But I think that that pendulum is swinging back a bit because of data and the internet." Examples include China's chillingly precise surveillance apparatus and "social credit system," by which the government monitors its citizens and assigns them a "score" according to their behavior. The big picture: Until now, the challenge to the post-World War II Western system has appeared to flow from mainly three public trends — a rejection of immigration, globalization and establishment leaders. These have led to a tribal mentality, in which nations and groupings within them are championing their own, and demonizing those viewed as outsiders. But these are just the threats from within. There also are perils from outside the West, and that is where technology has played a role. Big Tech and social media — weaponized for political purposes by Russia and others — have served as vehicles for sharpening the public divide. In the future, AI will super-charge the impact of both large tech companies and social media platforms, and offer autocratically minded leaders new tools for entrenching their power. 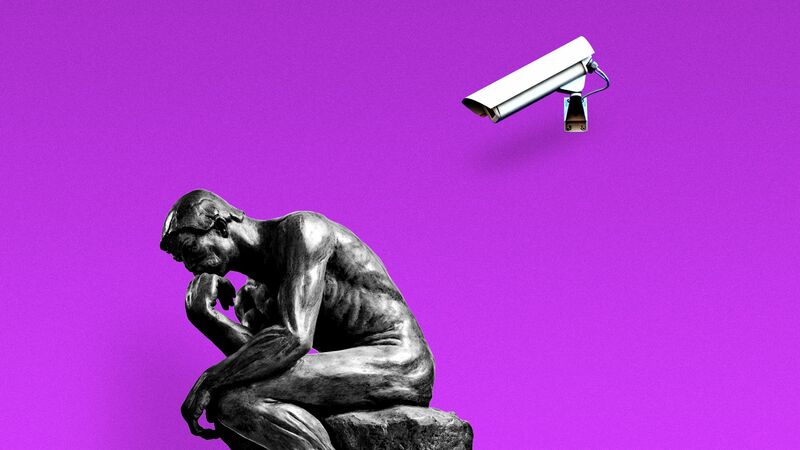 "These tools make it easier for authorities to track what is going on, influence the flow of information, and marginalize dissident voices," Darrell West, director of the center for technology innovation at the Brookings Institution, tells Axios. "At the same time ... it is easier through social media to find extreme voices and to exploit societal divisions, and harder to bring people together in a common purpose." AI is one of the most disputed technologies of the age, and not everyone agrees on its impact on politics. Nicholas Wright, a neuroscientist who works on technology, said AI does not clearly favor either democracy or autocracy. "History shows democracies and autocracies can both harness radical new technologies. "Any vast new autocratic control systems will be costly to run — [and] it's plausible those costs will be low enough to compete with liberal democracies, but that's still just a bet." A seventh suicide this year among New York's professional drivers puts new pressure on the city to help resolve a financial crisis in the industry. In a ceremony yesterday, fellow drivers and others remembered Fausta Luna, an Uber driver who jumped in front of a subway train and died on Sept. 26. Luna was deeply in debt, write the NY Post's Danielle Furfaro and Amanda Woods. In August, amid a saturation of cabs, black limousines and ride-hailing vehicles, the New York City Council halted its issuance of new for-hire licenses. It is also studying a minimum wage for drivers. The move, following the suicides of six drivers, was the first by any U.S. city. Since 2011, when Uber launched in NYC, the number of licensed for-hire vehicles in the city has almost tripled to about 112,000. The big picture: Uber is the most visible face of the new "gig economy," the rise of freelance work with often irregular pay and no benefits. Given forecasts of the continued expansion of gig work, numerous experts have raised the issue of regulating it as a public policy priority, for instance by requiring portable benefits. Uber has favored portable benefits but fought caps on the number of drivers. With the limitless selection and convenience that e-commerce offers consumers, online retailers are selling more and more goods. But they are also taking a lot back. What's going on: Some of the biggest e-commerce businesses report staggering sales numbers — but huge pieces of that revenue often get erased in refunds to customers and shipping costs for returns, writes Axios' Erica Pandey. Customers returned about 10%, or $351 billion, of all purchases — brick-and-mortar and online — in 2017, according to the National Retail Federation. Return rates jump to about 30% or higher when looking at just online purchases. For example, Revolve, the popular online clothing seller, made $400 million in net sales in 2017, but paid out an almost equal amount, $385 million, for returns, writes Recode's Jason Del Rey. That doesn't include the cost of return shipping. About 6.5% or $22.6 billion of the returns were labeled fraud or abuse of store return policies. That includes falsifying receipts to profit or buying something with the intention of wearing it once before returning it. Between the lines: Companies have taken steps to limit money lost from ceaseless returns. Amazon customers report being banned for excessive returns, per WSJ. The company has also tried to anticipate clothing returns with Prime Wardrobe, a service through which shoppers receive a variety of sizes and colors to try. After picking the fit and style they like, customers can send back the rest in a prepaid box in one fell swoop. And a tech startup that calls itself a returns optimization platform, Optoro, has warehouses across the U.S. that accept returns, inspect them and then resell them on Amazon or eBay. Its clients include Best Buy, Target, Walmart and Home Depot. We previously reported that the gig economy has not been living up to some of its grand promises, and that ride-hailing drivers are making 53% less now than in 2014. Between the lines: Another danger of the gig model is income instability, with workers raking in $1,000 one week and a mere $100 the next, Erica reports. What's going on: An Irish startup called Trezeo, which has caught the attention of London VCs and MIT academics, thinks it can provide security for those gig workers by collecting all their money and paying it back out to them in steady paychecks. For the same flat fee of 5 pounds a week, Trezeo also offers "income advances" so customers can pick up quick cash in emergencies. The startup just won a grant from MIT to scale its business and plans to move next into pensions and mortgages for gig workers.